The symptoms of autism generally begin to emerge in a person between 12 and 18 months of age. Oftentimes, babies develop normally until this age, but then they start regressing and lose skills. 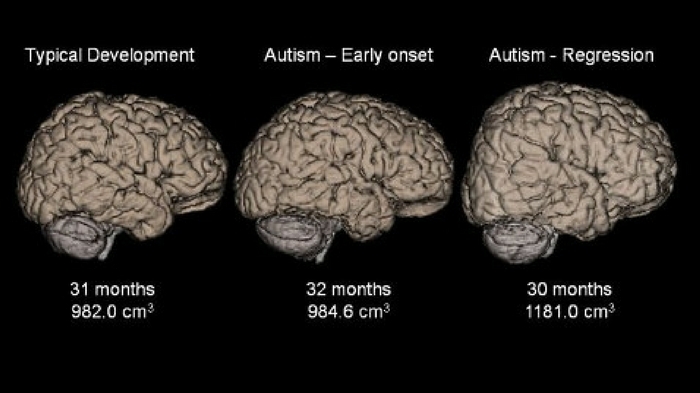 Now, a recent study suggests it may be possible to spot autism on an MRI scan months before symptoms start. For the study, researchers conducted MRI scans on 150 children, 3 times: at 6 months old, 1 year, and 2 years. More than 100 of those children were at high risk for autism because they had an older sibling diagnosed with the disorder. Infants with older siblings who have autism have about a 1 in 5 chance of developing autism spectrum disorder (ASD). The team found that 8 times out of 10, they could correctly predict which children would go on to develop autism based on the faster growth rate of the surface areas of their brains. They detail their findings in the journal Nature. The study’s lead author, Heather Hazlett, a psychologist at the University of North Carolina’s Carolina Institute for Developmental Disabilities (CIDD), says that enlargement of the brain seemed to correlate with the onset of symptoms, but more research is needed. The study was small, and doctors shouldn’t start conducting MRIs on children in an effort to diagnose them. Still, if the findings can be recreated in a larger study, MRI could become a new diagnostic tool for high-risk children before their symptoms begin, giving parents the opportunity to start treating their child at a time when treatment will be possibly most effective. We just have to be careful with recommending such measures, or we could see issues similar to those arising from mammograms (causing issues due to being unnecessarily overused). Currently, the average age of diagnosis is about 4 years.